A child's terminal illness and/or death is an almost unspeakable and fortunately rare tragedy in the developed world; the death of a child is considered an affront to the natural order in these societies because parents are not supposed to outlive their children. However, the death of a child is a far more common experience in developing nations. The experience is colored by these relative frequencies. In nations with seemingly limitless resources for cure, the tragedy of a child's illness and death is often unwittingly compounded by well-meaning members of the family, the medical establishment, and the community, through lack of acknowledgement of the child's suffering; continued application of harmful and unhelpful therapies; and a lack of effective response to the human issues the child and family endure as they struggle to maintain dignity and normalcy. The repercussions of this approach are felt long after the death of the child. Increased knowledge of the circumstances of childhood death and helpful responses may prevent these problems and improve the quality of life for all concerned. Who Are the Children Who Die? Patterns of childhood death vary substantially among nations, related primarily to the level of education of the masses, availability of resources, and other public health issues. In developing countries, children often die in the first five years of life from diarrheal illnesses and pneumonia (the most common and most preventable causes, each accounting for 3 million childhood deaths worldwide per year) and other infectious diseases. AIDS (acquired immunodeficiency syndrome) is becoming epidemic in many countries, particularly in sub-Saharan Africa. Every day, 6,000 young people under age twenty-four are infected with HIV. Every day, 2,000 infants contract HIV through mother-to-child transmission. Every day, more than 6,000 children under age five are left orphans by AIDS. And every day, 1,600 children die of AIDS. Across the globe, children under eighteen make up approximately 10 percent of the 40 million people who are living with HIV. Prevention and treatment of AIDS and its related complications is very expensive, and few African nations can provide their citizens with the required therapies. Thus AIDS is a more rapidly fatal disease in these countries; figures from the World Health Organization indicate that globally, during the year 2001, 2.7 million children under the age of fifteen were living with HIV/AIDS, 800,000 children were newly infected, and 580,000 children died of the disease; of these, the vast majority are in sub-Saharan Africa. In countries with access to greater education and resources, far fewer children die; those who do die during childhood die of a vastly different spectrum of causes. In the first year of life (infancy), these include congenital defects and malformations, extreme prematurity (birth prior to twenty-eight weeks gestation), and sudden infant death syndrome (SIDS). In the United States 27,000 infants die annually. Similar causes and rates of death are seen in the United Kingdom and Canada. The remainder of childhood deaths, occurring from age one to nineteen years, includes trauma as the leading cause (motor vehicle occupant, driver and pedestrian injuries, drowning, murder, suicide, and other trauma), cancer, and death related to congenital heart disease. Other less frequent causes of childhood death include cystic fibrosis, muscular dystrophy, and rare genetic disorders leading to severe brain dysfunction or other end-organ failure, such as liver, kidney, and immune system failures. The causes of death in children clearly differ substantially from adults. The rarity of childhood death hides it from view and from the collective consciousness of the public, thus depriving the common citizen and the health care professional alike of a feeling of competence in responding to such a situation, whether the affected child is one's patient, son or daughter, friend, or neighbor. Lack of experience with childhood terminal illness in particular and the promise of modern medical "miracles" in highly developed nations sometimes prevents the acknowledgment of the terminal state, with parents and health care personnel often insisting on trying one last "life-prolonging" or "curative" intervention, often when chances of improving or prolonging life are relatively small. The losers in this situation are often the patients as well as the guilt-ridden family, particularly as the latter reflect on their decisions after the child's death. 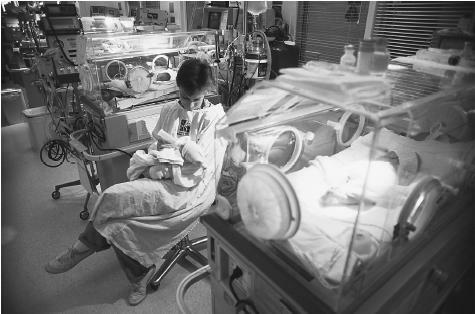 The neonatal intensive care unit in hospitals, certainly a foreign and technical environment to non-medical personnel such as parents, is one that many parents have to visit when their child's life is in danger. Unfortunately in less-developed nations, parents whose infant children die do not have the opportunity or funds to invest in this type of technological care. parents from the ill child's bedside to enable the parents to spend time with the sibling, and offering to do simple things, such as running errands to expand parents' free time. Families are particularly isolated in the case of traumatic death of their child, as there are no systematic provisions for bereavement care of such families and the grief is felt throughout the community, forcing society to recognize that death is unpredictable and that all children are vulnerable. This realization is difficult for members of the community, and creates barriers to support. When a child dies from a traumatic injury, there is no preparation for the death, no feeling that the child is "in a better place," no longer having to suffer the ravages of illness. Instead, a young, healthy life has been cut short, with no redeeming features of the loss. However, when the possibility of organ donation is offered, many families feel that something good has come of their pain. Nevertheless, sudden death, whether from trauma or SIDS, seems the most difficult for bereaved parents to mourn and to effectively reconstruct a new life without the child. Medical care providers, trained to focus on cure as the only positive outcome, often feel at a loss as to how to be helpful when it is determined that the child will in fact die. With no education regarding symptom relief or how to address psychological and spiritual distress, the medical caregiver may retreat from the care of the patient in order not to be reminded of his or her inability to "do something." Training in medical school, once focused on providing comfort, has devolved to a technically oriented, fact-filled curriculum, often with little to no emphasis on enduring and unchanging issues of human interaction or on inevitable death. Virtually no curricular time is devoted to the management of symptoms, outside of the symptom relief achieved by the reversal of the pathophysiologic process. This problem is exacerbated in pediatrics and pediatric subspecialty training, as death is considered to be so rare as to not merit allocation of educational time. Bereavement care, critical to the well-being of survivors of childhood death, is virtually never addressed. It is of interest that veterinarian trainees are taught to send condolence cards, but the idea is never mentioned in the medical curriculum. In fact, the New England Journal of Medicine published an article in 2001 that was an impassioned plea regarding how and why to write condolence letters. Bereaved parents, when interviewed about what would help alleviate the pain of the loss of a child, recurrently stated that evidence that people care about and remember their child, including sending a note using the child's name or a simple phone call, meant more than most people imagine. Ignorance about the tremendous healing provided by communication and contact with bereaved families prevents health care personnel—including physicians, nurses, social workers, and members of the larger community—from providing such healing. In response, health care personnel, not used to this feeling of impotence, may leave practice or become hardened to the needs of the child and family, becoming brusque and seemingly uncaring. When medical education addresses the full spectrum of medical care, including care for those who will not be cured, many of these problems will be resolved. Few children have terminal conditions; many more children die of trauma. Of the remainder, few die of the same disorder; for example, cancer, which is itself very heterogeneous, claims 1,200 children's lives per year in the United States and is the most common disease diagnosis among children who die. Thus, it is difficult to obtain an effective research sample size. Because of the small numbers affected, allocation of research dollars has not been generous, compared to other causes. Without research, provision of pediatric palliative care will continue to vary from institution to institution. It will be based only on the expertise of the local practitioners and their own uncontrolled experience with relatively few patients, compared to research studies. Therapies offered will not be proven to be efficacious, but rather be therapies that have worked in one or a few other patients. Academics and the medical community feel that such anecdotally based care is not worthy of teaching to trainees, as it is unproven and not scientific. Thus, the vicious cycle of ignorance of how to care for such children and families is perpetuated. In the absence of research and education, children and their parents will continue to suffer unnecessarily. For example, the provision of effective pain management for children terminally ill with cancer is not taught. A study by Wolf at the Boston Children's Hospital of the Harvard Medical School, found in a retrospective survey of parents of 103 children who had died of cancer, that only 80 percent of children, most of had pain severe enough to cause substantial suffering, were assessed as having pain at all. Moreover, while there was an attempt to treat the pain in 80 percent of these cases, treatment was effective in relieving the pain in only 30 percent. Research specific to children, not research performed on adults, is essential. Children of different age groups have different physiology from each other and from adults. Infants and younger children differ physiologically from older children in many ways, such as with regard to enzyme maturity, organ function, percentage of body water, and neural processing. In addition, infants and children differ dramatically according to age and maturity in their perceptions of their situations, the ability to employ self-calming techniques, the success of external sources of comfort, the degree of the spiritual impact of illness, and other "psychosocial" ramifications of their conditions. Thus, extrapolation from adult literature and data is insufficient. It is critical that research on palliative care specific to children be conducted—for both the ethical care of these children and the effective reintegration of their survivors. Moreover, once the information is documented scientifically, academic medical centers are more likely to include the information in their curricula, tremendously broadening the impact of the research on the care of children living with life-threatening conditions. In fact, both the Royal College of Pediatrics and Child Health in the United Kingdom and the American Academy of Pediatrics have called for increased research in palliative care for children, in addition to exhorting increased education on the topic during pediatric and subspecialty training. At its best, palliative care for children addresses the child, parents, siblings, extended family, schoolmates, and other affected members of the community. It addresses the physical, social, spiritual, and emotional aspects of death and dying. In order to accomplish such goals, a team—consisting of the family, community, hospital, and hospice personnel—delivers palliative care. Principal team members include the child, family, physicians (primary care and specialist), nurse, care manager, social worker, and chaplain. Other critical team members include pediatric psychologists and child life therapists, both of whom address the concerns of the child and siblings in a developmentally appropriate manner. These professionals often use art therapy—art, play, music, and behavioral observation—to treat the child. Because children may be unwilling to divulge information directly to parents or their main caregivers due to their fear of hurting them or offending them, these skilled therapists are available to assist with the communication and interpretation of the child's concerns and desires, as well as to provide the child with advice and an open invitation to reveal innermost thoughts. When child life therapists or child psychologists are involved in the care team, children's views of their situation and their priorities are more likely to be solicited and honored. However, the role of these therapists is neither understood nor reimbursed by payers, primarily because their participation is seen as being "not medically necessary," and thus their availability is often tragically limited. In 2000 the American Academy of Pediatrics validated the role of the child life therapist in providing the child with the opportunity to participate meaningfully in his or her care decisions. Pediatric palliative care is in the early developmental stages. The United Kingdom has the most highly developed system, with two specialist physicians and a nurse training program, as well as twelve hospices devoted to children in England, one in Scotland, one in Wales, and one in Australia. Helen House, founded by Sister Frances Dominica in 1982, was the first of such houses. Hospice in England was initially funded purely through private donations. The houses were designed to care for children from the time of diagnosis of a life-threatening condition. Their function is to provide respite care (care when the child is in his or her usual state of health, providing family caregivers with a needed rest and time to rejuvenate themselves for their continued efforts), to provide or train community based pediatric specialist nurses, to provide case coordination, and to provide a twenty-four-hour hotline for symptom distress. Children may also come to the hospice for their final days. Children cared for in these hospices often have chronic, progressive, or severe, static neurological dysfunction. Research on palliative care for children is infrequently reported by these busy clinical services. In addition, there are two pediatric palliative care physician members of interdisciplinary palliative care teams based in academic hospitals. Their primary focus has been the child dying of cancer, although the programs are expanding to include children with other diagnoses. In the United States, the term hospice denotes a package of services only available to patients who have been determined by their physicians to have less than six months' life expectancy and who have chosen (or, in the case of children, whose parents have chosen) to forgo further life-prolonging therapies. The package is determined by the federal government (with other payers in general mimicking this program) and mandates standards of care, including that the care is overseen by a physician; that visits occur every other week at a minimum, and more often as needed, by nurses and social workers; and that pastoral counselors, home health aides, and volunteers are also part of the team. There is no requirement for caregivers to have pediatric experience or education. Care is delivered primarily in the child's home and respite appropriate to the needs of children and their families is infrequently available. Bereavement care for the family is mandated for thirteen months after the death, but with no additional reimbursement provided to the hospice; thus, some programs provide written information on a monthly basis, while others may provide personal counseling and support groups. Rarely is there a sibling-specific program for bereavement; their needs generally go unmet. It has been found that the shorter the patient's hospice stay the longer the bereavement needs of the survivors; children tend to be very short stay hospice patients. The U.S. hospice benefit is paid as an all-inclusive daily rate of reimbursement. All professional time, medications, equipment rental, therapy, and other care are included in this rate. In 2001 the average daily rate was $107 per day. This rate of reimbursement may preclude the administration of symptom-relieving interventions, including, for instance, the administration of blood products that increase the child's energy enough to play and interact with others, decrease breathlessness, and thus improve the ability to sleep and eat, or decrease bleeding problems. These are frequent concerns in childhood cancers, which primarily affect the bone marrow. Arriving at a prognosis of less than six months for a child is fraught with difficulty due to societal expectations as well as the rare and thus unpredictable nature of some pediatric fatal disorders. Choosing to forgo "life-prolonging therapies" can be difficult for other reasons, as well. Some children have been ill all their lives; differentiating daily therapeutic routines that bring comfort from consistency versus life-prolonging care may be impossible for the family, practically and psychologically. To address these problems, large hospices have obtained expensive home health licensure to enable the care of children not willing to accept the restrictions of hospice, but who need palliative care in addition to the traditional life-prolonging care model. This marriage of hospice and "traditional" care is called "palliative care" in the United States. It is care that is rarely available for adults or children. However, hopeful changes have been occurring since the early 1990s. Forerunners in this area include Drs. Kathleen Foley and Joanne Lynn, with funding from the Open Society Institute and the Robert Wood Johnson Foundation. Due to these and other efforts, palliative care for adults and children is slowly beginning to emerge. In 1999, at the urging of pediatric palliative care experts, the federal government of the United States allocated a small amount of funds to investigate new models of care for children living with life-threatening conditions and their families through five state Medicaid waivers. The Institute of Medicine, a branch of the National Academy of Sciences, a nonprofit, non-governmental body of expert scientists and consultants, is reviewing the evidence regarding the benefits and costs of pediatric palliative care. Numerous curricula on pediatric palliative care and texts devoted to the subject have been published or are under development, including the Compendium of Pediatric Palliative Care, distributed to various nations in 2000 by the U.S.-based National Hospice and Palliative Care Organization. In London; Sydney, Australia; and Boston, Massachusetts, three major children's hospitals have pediatric palliative care services with physician directors. These services began from care for children with cancer and are expanding to include children with other life-threatening disorders. One innovative program at the University of Texas in Galveston addresses the needs not only of the chronically ill or cancer patient but also the victims of sudden death. Called the Butterfly Program, the program consists of home-based hospice and palliative care, hospital-based palliative care consultation, and a room (called the Butterfly Room) devoted to the care of children living with or dying from life-threatening conditions, including children who are the victims of trauma. Although it has many uses, the Butterfly Room, located one floor above the pediatric critical care unit and on the same floor as the cancer and chronic care wards, most benefits families whose children die suddenly. There is space for over fifty people to be present. The room has numerous rocking chairs, a living room area, a kitchenette, and a sitting alcove, in addition to sofa beds, a full bath, and the equipment to care for a child receiving any kind of life support. When children are transferred to the room, the agreement has been made to remove life-support systems that same day. Prior to transfer, all monitors are removed, all investigations and interventions that do not promote comfort are discontinued, and all equipment that is unnecessary for comfort is also removed. Families are invited to bring other family members, friends, neighbors, or any other supporters with them. The reasons for the family and care team's decision to stop attempts to prolong life are reviewed. Questions are entertained. Explanations of the events of the day are provided and questions again answered. Any rituals are encouraged, including bathing the child, dressing him or her in personal clothing, singing, chanting, crying, praying, and taking photographs and videos of the events. Handprints and or hand molds are made, if desired. When everyone is prepared to let go, the parents are asked whom they wish to be present at the time of the removal of the life-support machines and who should be holding the child. Prayers may be offered as well as the comforting idea of seeing the child's face once more without tape and tubes. Hospice personnel provide bereavement assistance for as long as the family needs attention and care. The program has successfully been transferred to other sites at university hospitals in San Antonio, Texas (where it is called the Mariposa Room), and Kansas City, Missouri (where it is called the Delta Room). Another is being developed in Greenville, North Carolina. However, reimbursement for this highly valued care is nonexistent. Although the best outcome for children is a long and healthy life, that end result is not always possible. When a child is not responding to therapies, it is time to entertain the possibility that he or she may die and to increase the emphasis on the importance of quality of life considerations and the child's priorities (when developmentally appropriate) in making treatment decisions. Medical care, for all its promise, is still filled with pain, other adverse treatment-related symptoms, isolation, fear, self-doubt, and loss of freedom to be a child, to enjoy playing and exploring one's world. When the child is still well enough to enjoy the opportunity to participate in life, that time is too often spent pursuing an elusive "cure." When the focus should be on the optimization of symptom control and attainment of personal goals or being in a familiar and comfortable place, too often the time is spent in the clinic, hospital bed, or intensive care unit. Parents need "permission" from the medical community, family, and friends to stop pursuing life-prolonging therapies; often they are afraid of offending their physicians, being accused of not loving their children, or being neglectful or selfish. Unfortunately, children's own ideas and preferences about their care are not routinely solicited and, if offered, are ignored, which frequently increases their sense of unimportance and isolation. Not only are the children victims of the societal mandate to "keep trying," but so are other members of the family, who are deprived of opportunities to share new adventures and insights or to invest in new forms of hope, rather than in the allconsuming quest for cure. Parents suffer in all cases of chronic illness and of death of their children; unable to protect their children, they are rendered powerless and helpless, too often feeling guilty for things beyond their control. Parents often ask themselves: "What if I had noticed the lump sooner?" "What did I do to cause this?" "Why couldn't it have been me?" Well-intended family and friends who do not know how to respond may inadvertently compound the problem by avoiding contact in order "not to remind the family" of their loss, isolating them at the time they most need companionship. Employers may not understand the demands of a sick child or the duration and toll of parental bereavement and may exhort the parents to "get on with their lives." The ill child him- or herself often feels guilty; children are able to feel the tension and are aware of the fact that they are in the center of it. The ill child is also aware that he or she is ill and even that he or she is dying, even if the child is never told. In fact, the ill-advised admonition (and natural tendency) to "hide" the status of the child's illness from the child was reversed when Bluebond-Langner's research in the 1970s ( The Private Worlds of Dying Children ) indicated that children (with cancer) who were terminally ill were aware of the fact, often before their physicians and parents were aware of it. When adults and others denied how ill they were, the children felt abandoned. Current advice of informed professionals is to involve children in the own care, clarify their questions, and answer them simply and honestly, remaining open to additional queries and disclosures of fears and concerns. Adults can help by allowing the child to see his or her sorrow, share how to respond, and offer mutual strength. Difficulties in caring for terminally ill children include: (1) the lack of a definition of the relevant population; (2) societal, family and medical practitioner unwillingness to acknowledge the terminal nature of certain conditions; (3) lack of researchbased knowledge to enable effective treatment specific to the population; (4) lack of existing personnel with appropriate child-specific expertise; and (5) poor access to resources and systems to care for such children and their bereaved survivors. Regardless of the wealth and advancement of nations, care of terminally ill children remains challenging. Despite these challenges, pediatric palliative care of the twenty-first century is improving. Needed changes to the delivery of care for children living with and dying from life-threatening conditions are beginning to emerge. There is a desperate need for the community, educators, researchers, and legislators to acknowledge these children and their families. Simple compassion is a good start, both for laypeople and health care professionals. Scientific investigation, intensive education, and changes in the regulation and reimbursement of health care will lead society to the realization of the potential for effective care for children who die and their families. American Academy of Pediatrics Committee on Bioethics. "Informed Consent, Parental Permission and Assent in Pediatric Practice." Pediatrics 95 (1995):314–317. American Academy of Pediatrics Committee on Bioethics and Committee on Hospital Care. "Palliative Care for Children." Pediatrics 106, no. 2 (2000):351–357. American Academy of Pediatrics Committee on Hospital Care. "Child Life Services." Pediatrics 106 (2000):1156–1159. Bedell, S. E., K. Cadenhead, and T. B. Graboys. "The Doctor's Letter of Condolence." New England Journal of Medicine 344 (2001):1162–1164. Bluebond-Langner, M. The Private Worlds of Dying Children. Princeton, NJ: Princeton University Press, 1978. Grant, James P. The State of the World's Children. Oxfordshire: Oxford University Press, 1995. Joint Working Party of the Association for Children with Life-Threatening or Terminal Conditions and Their Families and the Royal College of Paediatrics and Child Health. A Guide to the Development of Children's Palliative Care Services. Bristol, Eng. : Author, 1997. Piot, Peter. "Speech to the United Nations General Assembly Special Session on Children." In the UNAIDS [web site]. Available from www.unaids.org/whatsnew/speeches/eng/2002/PiotUNGASSchildren_1005.html . Wolfe J., H. E. Grier, N. Klar, S. B. Levin, and J. M. Ellenbogen. "Symptoms and Suffering at the End of Life in Children with Cancer." New England Journal of Medicine 342 (2000):326–333. World Health Organization. Cancer Pain Relief and Palliative Care. Report No. 804. Geneva: Author, 1990. This was a very good article for me to come across as I have a terminally ill child. She is four years old and has a very rare disease called Pelizaeus-Merzbacher Disease. She was diagnoused with this when she was 9 months old. I have watched her health decline this past year 2006 she has declined rather quickly and Hospice is helping with the Palliative care as her lower lobes of both lungs have deminished and the diaphram is deteriorating, my daughters doctors did not know (or did not what to) what to use for the pain and how much, I really had to fight so that she had relief from this pain, there is no reason to have her suffer in pain like that. The doctor's were afraid that the pain medication could hurry the disease along, which it really has not. This is very painful for the parent to see and know that there is nothing we can do to help with the child's pain. The pain is controlled and my daughter can give a smile or even a laugh which helps me deal better knowing that her little life is of a much better quality. She sleeps alot more but it is more restful.